Boy did we have a ball? 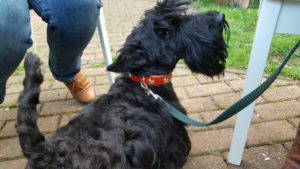 Pudding, the wheaten Scottish Terrier, turned two years on April 1 (well someone has to) and he celebrated in style with his mates from the London Scottie Club who just so happened to be having their monthly meet-up at the same time. Scotties numbered nearly into double figures, as they marshalled in to the Kew home in south-west London. Jimmy (left) with Pudding. No one knows if a nicety was exchanged at this point! 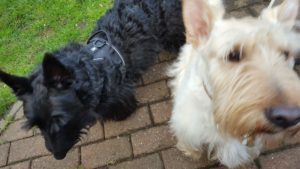 Making his first appearance was Susie’s Jimmy, a HUGE black Scottie, as well as Wilf, a Scottie who came all the way from Lancashire’s Lake District! No kidding. More about that later. Another joining us was regular Ben, brought over by Jann who had just returned from a six-week holiday touring New Zealand – only to find Ben’s “helpers” had overfed the boy. Still there was no chance of dieting last weekend! Regular Captain was there too, courtesy of Sonya, and then there were a few welcome imposters. Irish Terrier Rufty who famously picked on Pudding’s brother Pikush at Pudding’s first birthday a year earlier and lived to regret it when Pudding, Milly and others piled into poor Rufty, made a magnanimous re-appearance without incident this time. 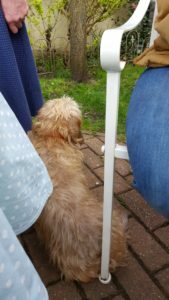 And Milly, Pudding’s heartthrob long-haired Datschund, was there too. She managed to come in via the kitchen and made a bee-line for Pudding’s own slice of dog-friendly birthday cake – so inevitably, Pudding put her in her place! Otherwise, it was a fun get-together and chance for old friends to make new ones. 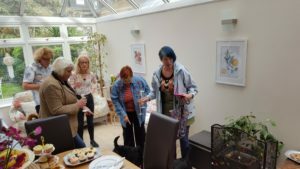 We were joined by young Wilf, who was escorted by Cath Marchbank, a representative of the Scottish Terriers Emergency Care Scheme “STECS” (more info click here) who kindly explained more about the work STECS, which turned 40 year last year, does. 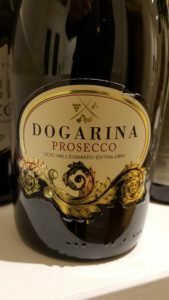 It was especially interesting to learn that this charity not only attempts to re-home and gives safe custody to at-risk dogs, but it also endeavours to help owners who face medical expenses insurers don’t fully cover. 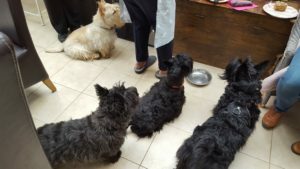 So awareness about what STECS does and help fundraising for needy pooches is something the London Scottie Club is especially keen to help foster. George Matlock and fellow LSC member Susie Page were also officially named the first representatives of STECS in the Greater London area. Members shared their latest experiences with grooming services and what food their dogs like best. The usual chit-chat prevailed and new bonds were formed. A few members who had planned to come – three that we know of – did not attend for reasons that were communicated and we hope to see them at subsequent events. But despite eluding the camera Pikush was there too. We hope that other members will send in their photos! Surely someone was taking the piss! But we weren’t only celebrating Pudding’s 2nd birthday. 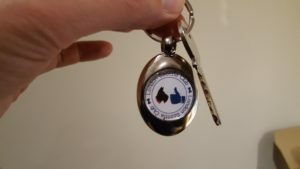 We also celebrated the first year of LSC with special club keyfobs for members, which double up as a holder with a special £1-sized token you can use when you next have to put a coin into a shopping trolley to release it. All practical stuff. The next event is expected to be a healthy walkabout in deepest Surrey near Boxhill, and details will follow online shortly. Finally, anyone who was keeping in touch with us via Meetup.com is reminded that service is no longer available. We will be launching a WhatsApp notification service in time for the May meetup in Surrey. WhatsApp is a leading messenger service and even allows free phone calls via the internet, and it works on all types of smartphones. It will allow us to send you timely reminders and messages so you need never miss anything, even if you are not normally on social media. We will contact all members to confirm we have their correct mobile phone numbers and to seek their permission to add them to our service. In case you don’t yet have WhatsApp it is a FREE app which you can download from AppleStore, GooglePlay, Windows Store, and also works on Blackberry and Symbian legacy phones. Download it today! If you are already reading this event review on a mobile phone, just click on this link to choose the right version for your phone and download now! We also invite members who attended to include their event reviews to this report. You can do so by commenting in the box underneath this event report now! 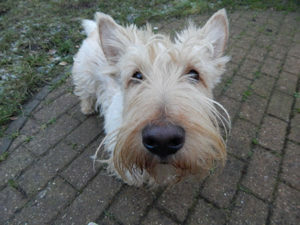 Last but not least Pudding would like to thank everyone who came last Saturday and made his day special. Thank you for all the presents and bottles of bubbly for the adults! The toys and treats! 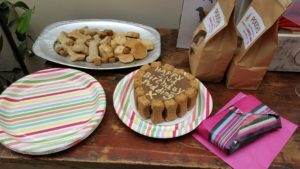 And thank you to Posh Pups of Kew for delivering a superb birthday cake for Pudding’s special day. See you for the next meet up next month!